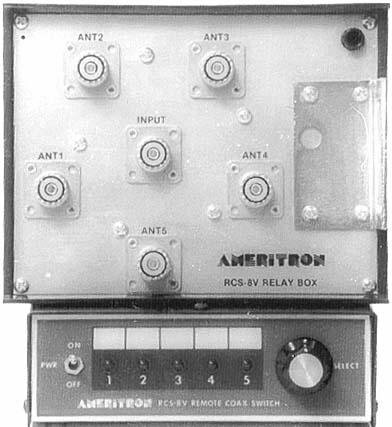 Ameritron RCS-8V Remote Coax Switches switch up to five separate antenna coaxial cables using one control cable and a single feed line run to the station. RCS-8V remote antenna switches consists of two units; the weatherproof relay unit that mounts on your tower or mast and the control unit that is placed at your operating station. VSWR is less than 1.2 from DC to 250 MHz and less than 0.1 dB loss at 150 MHz, great for the HF/VHF/UHF operator. These relays units handle up to 5 kW below 30 MHz and 1 kW at 150 MHz. You may ground unused positions or leave them open. RCS-8V Remote Coax Switches operate with an included 120 Vac wall power unit that supplies 13.8 volts at up to 500mA. Their indoor control units are all metal to limit RFI and TVI. Eight LEDs indicate the antenna you've selected. Their front panel has eight marking pad surfaces for labeling your antenna positions. Use any optional 6-conductor control cable to connect the control console to the remote relay unit using internal screw terminals. Ameritron's Remote Coax Switch lets you remotely switch up to five separate antennas using one inexpensive small control line (like standard telephone wire). Eliminate a tangle of troublesome coax and have a simple and neat installation with just a single feed line. The RCS-8V consists of two units, the weatherproof switching box that mountson your tower or mast and the control unit that's placed at your operating station. VSWR is less than 1.2 from DC to 250 MHz and less than 0.1 dB loss at 150 MHz, great for the HF/VHF/UHF operator. It handles over 5 kW below 30 MHz and 1 kWat 150 MHz. You can ground unused positions or leave them open. RCS-8V operates from a 120 VAC power source or RCS-8VX for 220/240 VAC. Use any 6 conductor control line (not supplied) and allows safe operation with 14V control voltage. If you have any questions about this product by Ameritron, contact us by completing and submitting the form below. If you are looking for a specif part number, please include it with your message.